15 years ago today, Dandy was celebrating his 2nd birthday. Today is a great day. Not only does it mark the 1st entry in what I have decided is going to be volume 2 of my diaries, but it's also MY BIRTHDAY!!! Me and Flopsy Girl are going to party all day, and then this evening, we are going to let our pet 2-foots join in (at least we'll let them join in as long as they have bought me a present). Yesterday, the 2-foots went to the open day for the Bunny Burrows sanctuary, so they will have had ample opportunity to buy me something. If they have failed, THERE WILL BE TROUBLE! Happy birthday to you, happy birthday to you, happy birthday dear Dandy, happy birthday to you. We all hope you have a wonderful day. I hope you have a really fun day with lots and lots of treats. I think we should all get some TREATS to celebrate your Birthday as well. What a great idea. That way, when any one of us has a birthday, we can all have some treats. Now how do we tell the 2-foots about our decision? I'm not sure but as I'm only 1. So I'll bow to your greater intellect on this one and let you tell the 2foots. Maybe in your comments at the end of bunny-camp news? Maybe..... I'm not sure that I would get away with that one though. If the 2foots look at you and think that you are greedy and that you shouldn't have treats when it's someone else's birthday - REMIND THEM - that they go to a place called "The Pub" and to other peoples houses to have their kind of treats when it someone else's celebrations! Now we have to be firm about this as the 2foots will try anything to get out of this as we all know 2foots will - they of course don't like to be told by us clever individuals that we know better than them and that we know what they get up to when they go to someone's wedding, anniversary, birthday etc........ There will be a lot of treats for them coming up in the rundown to Christmas so they can't have one rule for one and one for another! We must keep these 2foots under control and not let them get away with things like stopping us going to online parties and having treats to celebrate - it just isn't on - before you know it they will be expecting us to bring them their treats and look after them! Nip it in the bud before it goes any further and tell them that online parties count just as much as going to a party in person :-) That'll stump them. Have a lovely evening Dandy, enjoy your presents and have fun. 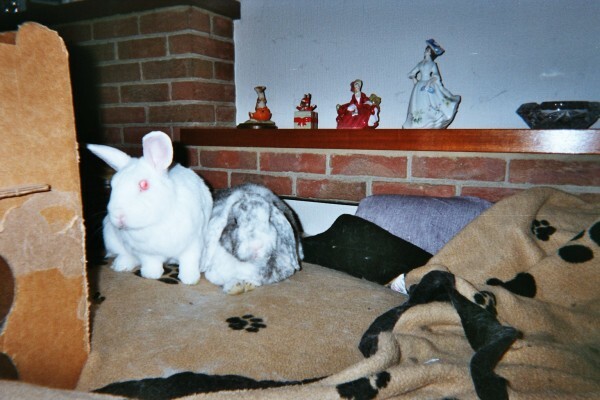 Have a lovely evening Flopsy and Dandy on your anniversary - make sure that you have extra kisses and snuggles. We'll have a word with Violet - she'll know how to go about telling the 2foots that we should all have treats when it's one of our friends birthdays or anniversaries. I'm having a terrific time, I'll tell you all about it tomorrow.